DiEM25 calls on all European nations to sign the Nuclear Ban Treaty as a matter of human survival. 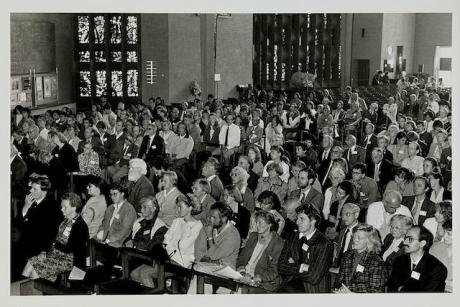 Opening ceremony for the fifth IPPNW European Congress,held in Coventry Cathedral in 1990. Wikicommons/ Wellcome images. Some rights rserved. North Korea's sixth nuclear test, which it apparently conducted today, comes while the world's other nuclear powers are arming up. All nine of the world’s countries with nuclear weapons are investing massively in modernising them, according to a new report out last week by SIPRI. This is despite a reported 3% reduction of 460 weapons in 2017.